The cooling system in your vehicle is essential to maintain the engine’s operation. If you do not provide routine scheduled Everett Land Rover Engine Coolant Service, the cooling system can fail. The result can be catastrophic damage to your car’s engine from overheating. What Color Should the Coolant Be in My Car? There is no single answer to this question. Each coolant is designed to cool a specific engine according to manufacturer’s specifications. The difference in color is a result of the chemical compounds added to the coolant for corrosion protection. It is essential that you consult your Owner’s Manual to determine the proper coolant for your car’s engine. 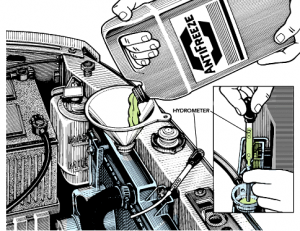 What is the Best Mix of Antifreeze:Water? Should the coolant freeze, it cannot circulate through the cooling system and will result in engine overheat. What Happens if Fluids are Mixed? Ideally, only the same coolant is used in your cooling system. If, however, you are in an emergency situation and absolutely must mix fluids, have the entire volume replaced as soon as possible. In a case where a completely wrong fluid (say, windshield washer fluid) is accidentally poured into the cooling system, if possible, do not drive your vehicle until the entire volume of the combined fluids is replaced! When Should the Antifreeze be Tested? How Often Should my Car’s Coolant be Changed? Please refer to your Owner’s Manual for manufacturer recommendations concerning frequency of coolant replacement. Generally, the coolant is not replaced fully until after 30,000 miles of service. To fully replace the coolant, the entire volume must be removed from the cooling system and disposed of in an environmentally sound manner. The correct coolant mixture (according to manufacturer’s recommendations) is then replaced into your cooling system. Flushing of the cooling system is done with distilled water (not under pressure), until it runs clear – although this is not always indicated. Ask the specialists at Everett Land Rover Coolant Service experts Conaway Motors if your system needs a full coolant replacement.